Our certified instructors have advanced degrees in exercise science plus extensive training experience. We provide individual assessments and counseling to help people at all levels improve fitness, nutrition, and avoid injuries. Whether you’re looking for instruction and guidance to improve your health, or you’re an athlete seeking to better your game, personal training is an asset to meeting your goals. Individual attention from a professional trainer can help you build critical skills, adjust training habits, and be a more strategic player, building the foundation for future success in your sport or your health. View our package options or contact Tom at thomasb@nooksports.com. 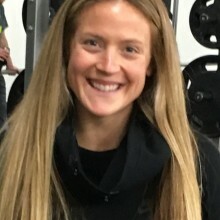 The Spooky Nook Personal Training Program is committed to providing an exceptional training experience by educating and assisting individuals at any fitness level to safely achieve their goals by creating a healthy and sustainable lifestyle. 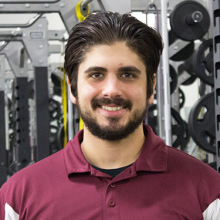 Our friendly, experienced trainers are eager to help you improve your health or your game. Schedule one-on-one or group sessions today and take your fitness to the next level. A two sport varsity athlete at Bethlehem Liberty High School in basketball and soccer, Tony Dague continued his sports career with varsity soccer and rugby at West Chester University. Dague coached for six years for the Hempfield Youth Soccer Club, two years with the Hempfield Youth Basketball Association, and is a member of the Roses Rugby Club men’s rugby team. He also volunteers for the Penn Legacy Soccer club as the Injury Coordinator where he assists injured athletes in a safe return to sport. 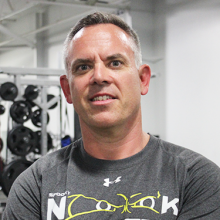 Tony is a graduate of West Chester University ’89 and Alvernia College ’97 with an Associate of Science Degree as a Physical Therapist Assistant. 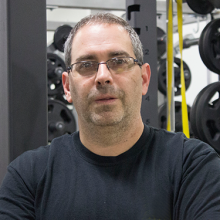 Tony is specifically passionate about ACL and shoulder surgical rehabilitation as well as helping youth athletes return to their sport. 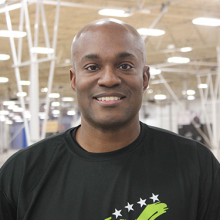 Tony has also earned Advanced Youth and Level 6 Diplomas with the National Soccer Coaches Association of America. In 2003, he was honored at the Pennsylvania Physical Therapy Association annual meeting as the year’s outstanding Physical Therapist Assistant. Philosophy: Each person is on their own journey. Training is not one size fits all. I get to know my clients and build a program to help them reach their fitness goals. I believe that everyone has a champion inside them waiting to shine. My goal is to help you find your inner fighter and use that fire to reach your personal fitness goals. 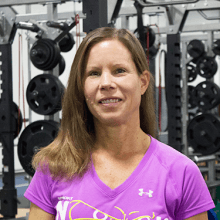 Whether that goal is to start working out for the first time in your life, or to push yourself to the highest levels in your sport, I can help you get there. I believe that working out should be fun, challenging, and rewarding. My clients have a sense of purpose and accomplishment that comes from setting goals for themselves. Meeting and exceeding those fitness goals keeps us motivated to do more! Philosophy: I enjoy helping clients achieve their fitness goals through personal exercise programs that are challenging, rewarding, and fun. Healthy and strong for life! Philosophy: In order to get to something, you have to go through something. Education/Certifications:Bachelors Degree from Lock Haven University of Pennsylvania in Recreation Management concentrating in fitness (College Education in areas including Kinesiology, Physiology of Exercise and Strength and Conditioning) Years of training experience with all ages and types of athletes. Currently fulfilling requirements for NSCA Personal Training Certifications. Philosophy: You build your body. It is your temple, and hard work and perseverance are your bricks and mortar. Interests: Fitness of course, the outdoors, kayaking, hiking, skateboarding, good times with friends, drawing, sleeping, warm weather, the list goes on and on! Philosophy: Exercise enhances every aspect of our physical and mental well-being. Creating goals specific to one’s needs and special considerations is essential in the prescription of an individualized program. Put in the time, effort, and consistency… You will be well on the way to success! The world of personal training may seem like an unfamiliar and mysterious realm. Questions about what makes a good personal trainer and the benefits of hiring a personal trainer may be circulating in your mind. That's why we've compiled everything you might be wondering about in one place. It's the personal trainer's responsibility to design a safe and effective fitness program. Together, you and your trainer will set goals, discuss any physical limitations or injuries you have and put together an all-encompassing training regimen for you to follow. A trainer will ensure you're performing every exercise safely and with perfect form. They'll push your limits, encourage you to achieve your intermediate benchmarks and help you accomplish your goals. Injury prevention: Trainers will keep you safe as you excel, decreasing your likelihood of getting injured. By watching your every move and ensuring proper form every step of the way, they'll keep you working hard without the risk of injury. Accountability: If you struggle with commitment or self-motivation — and even if you don't — your trainer will be there to help you stay fired up throughout your training journey. Personalized instruction and goals: Your trainer will help you reach specific goals through customized workouts. Every scrap of energy you put into your workout will go toward hitting your target. Efficiency: Following a specially designed program optimizes your workout time. You won't waste a single second with personalized training. Motivation: We know tough workouts can be hard to finish. Your personal trainer will help pump you up with all the motivation you need to hit your reps, up your speed and break your records. Progress tracking: Personal trainers don't just help you perform better — they also keep track of your progress. There's nothing quite like looking back at where you were when you started and comparing that to where you are now. There's more to a good personal trainer than playing a sport and reading sports performance magazines. Good personal trainers are certified, with degrees in fields such as exercise science, physiology, or kinesiology. They also have years of experience, so they know how to keep you safe while they train, motivate and challenge you. 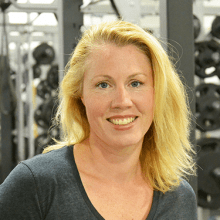 Where Does Personal Training Take Place? You'll likely take part in your personal training at a gym or sports complex. These spaces allow access to a full range of equipment for all your training needs. They're also a great place to feel inspired and inspire others with your training routines. If you're new to training, you'll likely want to meet two or three times per week for two to three months. At the end of those first few months, you and your trainer will evaluate your results and reset goals. For athletes, it's common to meet up to five times per week for at least six months depending on the training program. Some programs are year-round while others are seasonal.